MCRS works to let people know that domestic rabbits can and do make wonderful companions, as long as you are willing to meet them on their terms. They teach Bunny Basics classes, maintain a phone and email hotline so that people can contact them with questions or problems, and generally try to keep rabbits and their human companions living happily together. Meet Amber, one of the available rabbits at the Minnesota Companion Rabbit Society. The organization also hosts regular Hoppy Hour events, in which bunnies can come to romp and play with other bunnies. These socialization events are held at three locations around the Twin Cities. All rabbits must be spay/neutered and be in good health in order to participate. 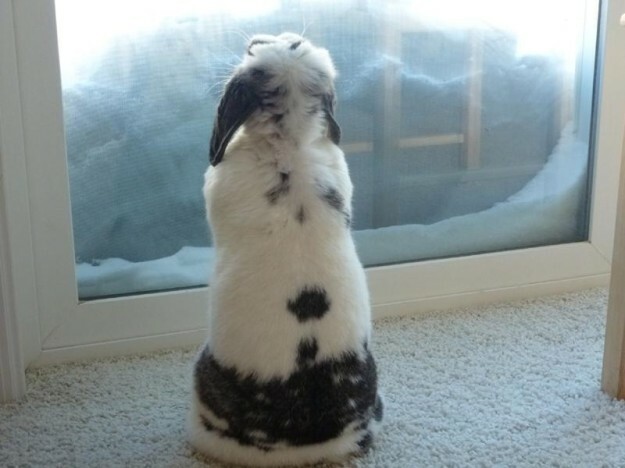 Learn more about the Minnesota Companion Rabbit Society at their website. The Minnesota Companion Rabbit Society is launching a new campaign to make Internet Bunnies the new Internet Cats. Starting today, people who love rabbits or who are suffering from cat video fatigue can visit www.mncompanionrabbit.org/internet-bunny/ to view a bunny-themed music video and four-minute documentary about domestic rabbits and the organization’s “Hoppy Hour” events. In addition, visitors are encouraged to vote on the rabbit they would like to see lead the charge versus Grumpy Cat, Lil Bub, Maru and their army of feline friends. Each candidate has a profile on the site that includes their personality traits, cat rival, least favorite cat video, and why they should win. Learn more and vote at the Internet Bunny website. Voting ends August 21.